Eagleman is usually hot and is non-wetsuit, so be prepared for that mentally. The chop can be tough, so work on doing strength sets in the pool vs. speed sets. For example, swim 5×500 on short rest, vs 20×100 on lots of rest. In order to have a good swim, seed yourself accordingly and know how much energy to put out for the swim. 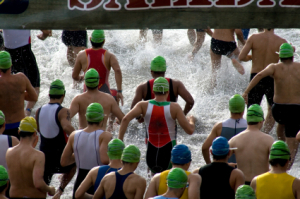 Try to swim in the open water as much as possible leading up to the race. Learn to sight – pick your head up every 4 strokes. Swimming straight and easier/slower is going to be much quicker than swimming fast and off-course. Learning how to start fast and to settle into a pace is a learned skill. One of the sets we have our athletes swim is little to no warm up in the pool and then do a set of fast 200s – then we swim a 500 at race pace, We finish up with another set of fast 200s. The idea of the 200s is to give the athletes an idea of how hard to go out in the swim, yet be able to bring it back down to settle into a sustainable pace. There are many factors that come into play when executing your best day at Eagleman. Fitness is only one factor that comes into play, as race day nutrition, and executing the best plan for you on race day are critical factors. For many athletes, riding a flat 90k bike in the aero position is something they don’t do very often. Being able to build up your core, back and legs to withstand this aerodynamic position will help a lot toward being as efficient as possible. Doing as much riding as you can on flat roads or on your trainer will help too. One common workout we use is 3-4×30’ at Zone 2/3 with Intensity Factor (IF) between .75-.85, and then we finish the set off with a sustained effort of .85-.88 IF. These teach the athlete to build the workout and eventually the race. In addition, setting yourself up for a great run directly coincides with keeping a relatively high cadence on the bike. My recommendation is to keep your cycling over 90 rpms, and there is evidence that shows cadence over 85 rpms is adequate as well. Pacing the race itself is a learned skill. For someone riding with a power meter, riding within .80-.88 IF is the appropriate power for a 70.3. RPE should be around 7 for this power range and power should be Zone 2/3. Drink more fluids than you think you need for this hot race. Getting used to using salt tablets can also be helpful for replacing electrolytes lost from sweating heavily. Finally, looking over your HR and power files on TrainingPeaks can also help keep you disciplined and within the right training zones. This sounds simple, but I’ve seen people make amazing progress by just analyzing and then following the plan! In order to put yourself in the best position for success in any race situation, the most important things are consistency and repetition. Consistency in executing the long run week after week, and repetition in hitting that race pace over and over again so it becomes second nature over time. Once your body knows what pace to fall into at the expected RPE and HR, you’ll be setting yourself up for success. One workout I like to have our athletes execute is a long run where you build RPE, Pace and HR throughout the session. We start out with a warm up, then 2-3x 20 minutes at Zone 2, RPE 6 and finish with a 2×15 minutes at RPE 7 and Zone 3. Only the fittest athletes will get a chance to add on a little Zone 4 and RPE 8 in our race day simulation workouts. In a course like Eagleman, heat training plays a big part. Whether you live in the area or not, you can train to simulate the race and its conditions. Doing your long runs at mid-day with multiple layers on would provide your body a chance to acclimate to the heat you’ll experience on race day. In addition, knowing what your fluid loss is during high temperatures will allow you to take in the right amount of fluid on race day. (Read this article on the TrainingPeaks blog for how to calculate your fluid loss rate). These two critical factors will go a long way to determining how well your run will go on race day. 1. Warm up as best you can. Every race is different but if you can’t ride a bike warm-up then you should do a short run warm-up and a few easy run activation exercises before the race. For the swim you can bring some stretch cords and do a few minutes of easy pulling to get your swim muscles activated. 2. Dial in your pre-race nutrition. Typically we lose about 600 calories overnight so those should be replaced upon waking, about 3 hours before your wave starts. If your stomach allows, I would sip on water and/or sports drink up until 1 hour before your race starts. I also suggest taking in a gel a few minutes before your wave starts as well. 3. Start your swim off right. You should seed yourself accordingly on the swim and build into the swim vs. trying to go hard at the beginning. Leave the super fast starts to the elite age groupers and pros! Sight often and stay on course. Better to go straight and go a little slower vs. going fast and swimming off-course. 4. Make sure your body is ready before fueling on the bike. Once on the bike, let your stomach settle before starting your nutrition plan. Once you feel like you have your bike legs built up to your desired wattage/HR/RPE…then get to work. Take in your nutrition on appropriate intervals and break the bike into sections. Don’t think about riding 56 miles as much as 14 miles 4 times, or whatever edible chunks you can break it down to. On the run, take the first 3-5 miles easy, usually at a Zone 2 effort/RPE 6. Get the fluids you need and take in calories as well. Once you are past 5 miles, it’s time to run! At this point you should be running in Z3/RPE 7 and starting to pass some folks who started out too fast. Take in some fluids at every aid station and some calories (gel or liquid) every third or fourth mile, depending on your pace (usually every 25-30 minutes is a good frequency). Once you hit mile 10 you should be able to pick up the pace and really let it go. 6. It’s not over when you cross the finish line. Don’t forget that when you finish, your body still needs calories so take in a protein drink and also walk a bit to clear some of the lactate from your legs. Sitting for long times isn’t recommended even though that’s what your legs are telling you! We asked some age groupers who have completed Eagleman race their race data and advice, too. In order to have your best Eagleman race, proper preparation in terms of race pace workouts, a solid nutrition plan and having a plan that you can execute on race day are what will help you achieve success! Good luck!